It’s one of those chores that has to be done, no matter how much we dislike it. And on the days where we have snow throughout the duration of the day, we often need to shovel two, three, maybe even four times! This physical exertion can take a toll on the body. We recommend that you take frequent breaks, monitor how you feel, avoid overexertion, and push, rather than lift, the heavy loads of snow. In periods of extremely heavy and long duration snowfalls, we’d advise more frequent shoveling, in lieu of waiting for it to clear up. Although it may seem to be a nuisance to be heading outside frequently, moving smaller amounts of snow at a time is better on your health and back. You’ve likely seen the salt trucks out in the midst of or after a winter storm. The principle of how this works is that the salt actually lowers the freezing point of ice. It melts the ice and makes the surfaces less slippery. The downside, is that if the temperature is 15°F or lower, salt will have limited effect. Additionally, if you are a pet owner, salt and other ice-melt products can actually cause chemical burns on your pet’s feet. It’s important to wipe pet’s feet off before coming inside. Some products can actually have not just irritating, but potentially toxic, implications for pets, especially as they lick their paws after a walk. Anyone who’s lived in Minnesota for a few years knows that we’re subject to periods of freezing and melting, and often even over the course of a few days! One potential complication of this is water, and eventually ice, backing up on your roof. As tempted as you may be to get out a hammer, chisel, or shovel to chop away at this ice, keep in mind you could cause damage to your roof. 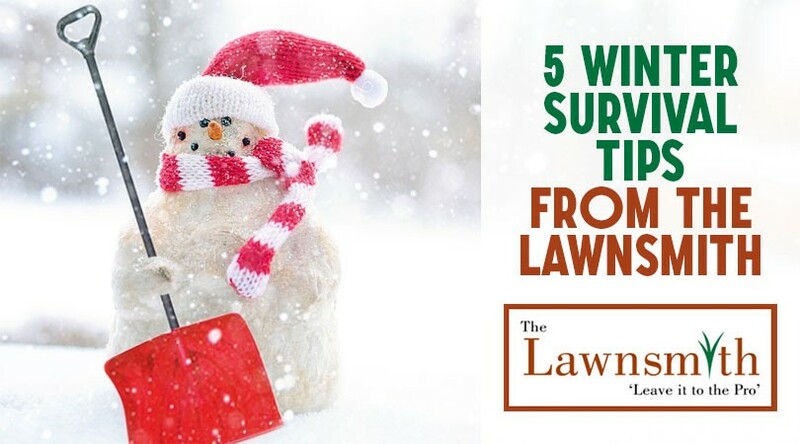 This is a winter service we offer at The Lawnsmith, and one that can potentially save you thousands of dollars in repairs. Many of us work long weeks, and the thought of having to keep up with what Minnesota winters throw at us is a frustration. Did you know that The Lawnsmith offers services which will help ease your stress and remove one more thing from your “to do list”? Whether residential or commercial snow removal, or roof raking, we’ve got you covered! Spend the time with your family inside by the fire or hit a ski slope or snowshoeing trail instead! We offer free estimates on our services. Once you live here in the Minneapolis area for a while, you soon grow to love the seasonal changes. And likewise, you realize how quickly the opportunities of each season passes. Why spend your time on snow maintenance when you can outsource that task to us? As an alternative, consider embracing the cold and snow by spending time outside enjoying it, meanwhile allowing The Lawnsmith to clear snow from your primary driveway and walkways. We can even clear your patios or arrange for other areas of snow removal. We hope you have a fabulous winter season, whether you prefer to enjoy it alongside a fire, or in the heart of where the snow adventures unfold. If you want more of either of those opportunities, get in touch with our customer service department to request a free estimate for snow removal this winter.